I also have a discount for you later in the post so stayed tuned! Now I don’t have one of the new planners yet – sadly – but there’s definitely some that have caught my eye. I’ll share those in part two so you can see what I might get! 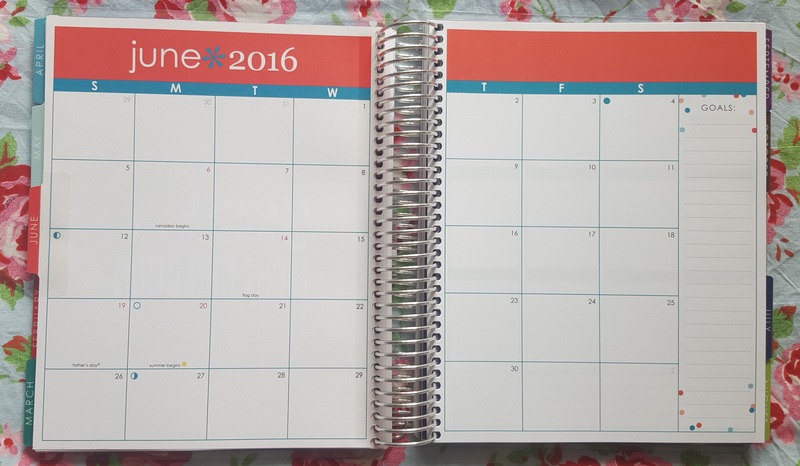 For now, however, I wanted to do a quick review of the 2016 life planner. It’s a little old now (over 5 months old, in fact) but will give you a great insight into what an EC planner is, if you haven’t already seen what all of the fuss is about. I never had one until recently and boy, I kind of feel like I’ve been missing out. As an introduction, it’s really vital to start with this: the EC planners are so customisable! They have different covers (a lot of the covers come with the option of personalisation too), different inside pages and different accessories that you can add or remove as you see fit. The planner itself is a coiled planner, so although you can remove the pages without ripping them out, it is harder as you have to uncoil them and then bind them again… Alternatively, you can take the pages out of the coil and hole punch them to fit into a ringed planner… I might be doing this so will share how I do it soon! The main differences between the EC planner and other brands is that you get a choice of what style you want your weekly spreads to be. I love this about them and wished more companies offered the various styles too (as everyone plans differently!). They have three options: vertical, horizontal and hourly. Chances are, you’ll find something to suit your needs! If you like to plan what you do each day by specific hours, for example, the hourly might be great for you. Whereas, if you wanted to break your day into three sections (say “morning, afternoon, evening” or “work, family, personal” or “to do, important, blog”) then the vertical could be the one for you. If you wanted your days to be lined so it’s easy to write in then perhaps the horizontal is the winner. They all have their pros and cons – you just need to find the right one for you. The one I’m sharing with you today has a vertical layout. The life planner that I purchased is a old design but there are plenty of gorgeous new covers to choose from! The covers are also interchangeable so if there’s an old style you want, you may be able to buy the covers themselves off someone. I went with the “new beginnings” cover which features a beautiful watercolour background and a great quote. 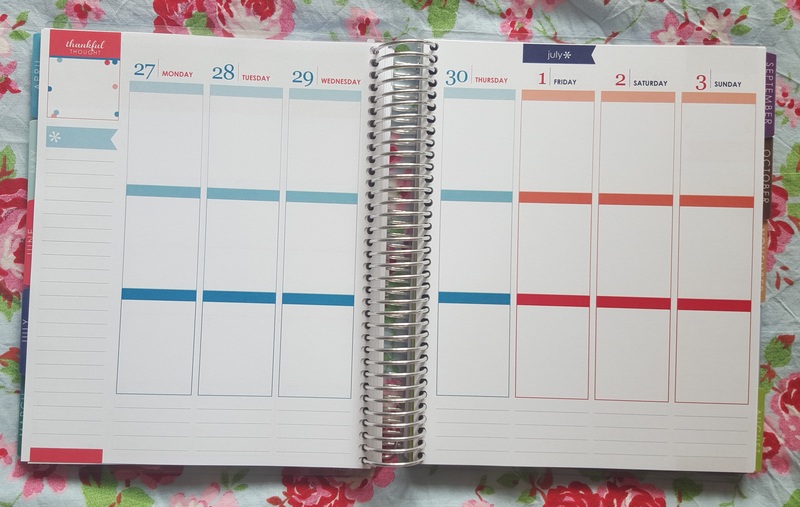 Each planner comes with a monthly view on two pages and then the weekly view of your choice. In the vertical layout, you get three boxes for each day. Under that, you get a few lines too. The lines are a great place to add extra notes that don’t fit into our other categories – like a food tracker, fitness/exercise tracker, finance tracker, hydration tracker etc. The monthly spread is same in each layout and lets you view your month at a glance, across two pages. There’s a great side bar that encourages you to write down your goals for the month in that space. To me, the ECLP is very much this – a goal setter, a goal planner, a goal getter. It just inspires me to go achieve those goals that I want to achieve – and the first step to achieving them is realising what they are and planning to achieve them. Personally I love the attention to the little details in the design on these planners. For example, they come with several sticker sheets for you to use (like birthday or even colourful plain ones). I noticed that this year there was a cute “Vote” sticker that was (probably) specifically added for the election of the new President later on this year. That’s an extra little bit of thought that went into the planner when it was designed, which I love. There is also a “thankful thought” box on the top left hand side. Now, I’ll be honest, most people just cover this up with a sticker (Erin Condren said so herself!) but I love this section. It’s so cute and it is a quick reminder that we should be grateful… And that we need to tell ourselves what we are grateful for regularly… This is said to increase happiness in the long term and spread positivity. This section is so cute for having space for this thankful thought – or if that doesn’t float your boat then perhaps you could use this space for a quote sticker of something that inspires you and will motivate you throughout the week. Underneath there’s lines for notes! A great place to write in any general to dos for the week or some notes… Or what about setting yourself Goals for the Week in that area? There’s so much you can put in that area. Each planner also comes with several sheets of note paper, with different designs, a double sided pocket and a plastic wallet. I’ll be honest, I really did struggle to open up the wallet… But when I managed to get it open (just keep pulling! ), there were some lovely freebies inside there, like a few extra stickers or a coil clip. Coil clips are what you use to add things into the binding of your planner. For example, if you wanted to add a photo that you can clip in then you could add it to the coil clip and then clip it in wherever you wanted. Price wise, these planners can be a little expensive! The more you customise, the more it costs. But each planner is handmade and so versatile, so it’s understandable. I got this one on sale, as it’s old stock and was lucky to do so. However, if you haven’t ordered before then you can get $10 off your first order by simply visiting this page. I am quickly falling in love with Erin Condren and am beginning to understand why people pay the price they do for them. If it’s something that will help you to achieve your goals and be happier in the long term then it’s money well spent in my opinion! Come back tomorrow for Part Two – a look into what EC can offer you in 2017 (or from next month, if you’re buying the 18 month version, which is also available). I am not affiliated to Erin Condren in any way. I brought this ECLP with my own money, whilst it was on sale and I just think it’s gorgeous so I had to share it. If you are interested in placing your first order, however, I do have a discount link for you. Visit Erin Condren by clicking here and you’ll be able to get $10 off (the code will be emailed to you once you’ve registered your account). I will definitely let you know! Need to do a follow up once I’ve tested out some pens and such in it 🙂 Thank you! My pleasure! Oh perfect, looking forward to that!